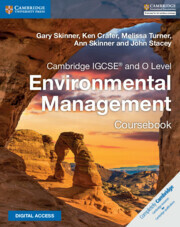 Cambridge IGCSE® and O Level Environmental Management Coursebook is tailored to the IGCSE (0680) and O Level (5014) Environmental Management syllabuses for first examination in 2019, and is endorsed for full syllabus coverage by Cambridge International Examinations. 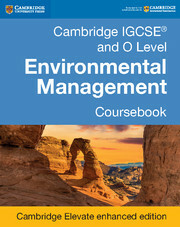 The coursebook comprehensively covers the knowledge and skills required and supports students as they prepare for assessment. 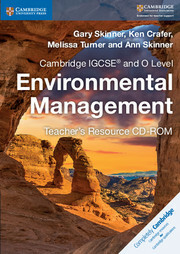 International case studies illustrate phenomena in real-world situations, while practical activities help students to develop their investigative skills. 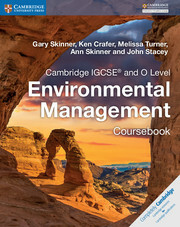 Exam-style questions and self-assessment questions encourage students to check their understanding and progress. Answers to all questions can be found at the back of the book.